Hiram Walker & Sons Ltd. seeking full-time production staff! WINDSOR, ON, Feb. 27, 2018 /CNW/ - Hiram Walker & Sons Ltd. is pleased to host an onsite open house event for resume drop-offs. 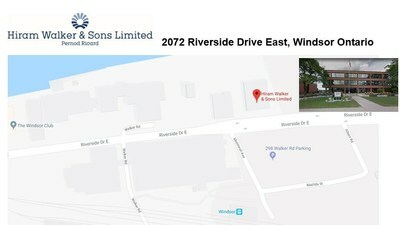 Hiram Walker & Sons Ltd. is seeking candidates for a number of full-time Bottling Technician and Manufacturing Process Operator roles, with wages starting at $20.46 (progressing to $31.46) including great benefits & pension programs. Job candidates can apply in person at the open house or online at corby.ca/careers. The roles will be posted online later this week. Hiram Walker & Sons Ltd. recently won Distillery of the Year at the 2018 Canadian Whisky Awards, among other prestigious awards for whiskies produced at the distillery. "We are very excited to bring in new talent and continue to grow our company," says Angelo DeMarco, HR Director at Hiram Walker & Sons Ltd. "As we mark 160 years since this company was founded, we're proud of upholding our tradition of innovation and quality that's made possible from the passion and dedication of our employees." To see all job openings, visit Corby Spirit and Wine's website at Corby.ca/Careers or on its LinkedIn page. Established over 150 years ago, Hiram Walker & Sons Limited's tradition of blending quality ingredients, processes and highly skilled people continues at the Windsor, Ontario based production facility. Hiram Walker produces brands such as J.P. Wiser's®, Lot No. 40®, Pike Creek®, Gooderham & Worts® and Royal Reserve® Canadian whiskies, Polar Ice® vodka, Malibu® and Lamb's® rums, and McGuinness® and Criollo® liqueurs for Canadian distribution by its affiliate, Corby Spirit and Wine Limited. Hiram Walker is a subsidiary of Pernod Ricard S.A., a leading global spirits and wine company with premium international brands such as ABSOLUT® vodka, Chivas Regal®, The Glenlivet® and Ballantine's® Scotch whiskies, Jameson® Irish whiskey, Beefeater® gin, Kahlúa® liqueur, Mumm® champagne, and Jacob's Creek®, Wyndham Estate®, Stoneleigh®, Campo Viejo®, Graffigna® and Kenwood® wines.